This is our 2014 tribute to all those who have fallen and our own families who took part in the wars of the last 100 years. Despite what I say in the video there are 1350 poppies in the display. 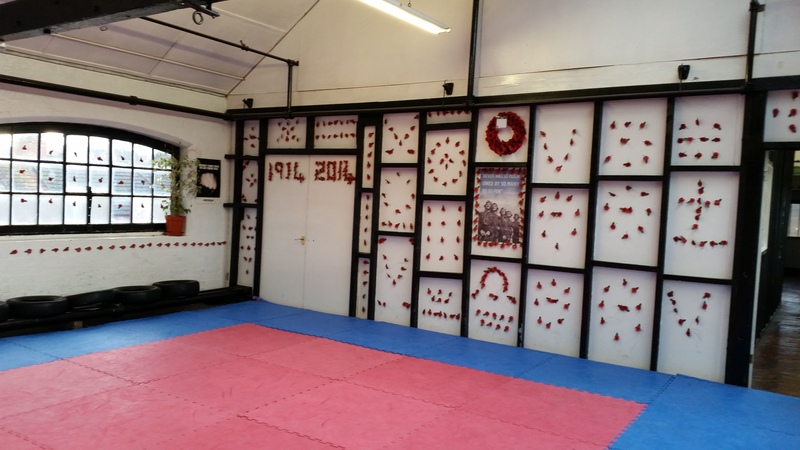 Yesterday I had the pleasure of helping transform our martial arts centre into a lovely and moving tribute to all the soldiers of Remembrance Day. We celebrate it in the USA as well but most Americans can’t see past the fact that they get a 3 day weekend. It was nice to see that there is still one nation that honors these brave men, women and let’s not forget animals that served in this war and sadly the ones that followed. As Andy said, sadly the War to end all wars didn’t. He asked for our stories so I’d like to share this with everyone. My country has an annoying habit of showing up late to World Wars. However, we did eventually get in and fight. I was always very close to my granddad. We were all proud of the fact that he served at the Normandy Invasion and survived.The bad weather of the day probably saved his life as by the time he got to the beach the German line had already been broken. Still, it was quite an awful scene to come across with so many casualties on both sided laying dead across the shore. However he said that this was far from the worst thing he saw during the war. I remember one evening when I was about 10 years old he told me the story that kept him awake at night. I still don’t know why he told me and, to my knowledge no one else in my family this but I got the privilege of hearing one of the most gruesome scenes anyone could witness. My granddad was a mechanic in the war. He used to fix the Sherman tanks. We later learned that he had won a medal for bravery when he had stop stop and literally fix a tank to get it moving again in the middle of gunfire. He told me one day he saw a young lad of about 15 or 16, a young soldier get run over by one of these machines. He was German and if I’m not mistaken so was the tank that ran into him. It was unintentional but that didn’t make it any less awful. What stuck out in my mind the most about this story was how my granddad described the screams of this young man and the sight of the blood that followed. I don’t think I ever saw my granddad cry in my entire life but he was on the verge when he told me this story. He however mentioned what happened when everyone else around saw what was happening. for a few fleeting moments people forgot whose side they were fighting on. The forgot the politics involved they forgot if they were American, British. German, Allies or Axis. They all simply pulled together to try and save this poor soldier. They were too late. This scene kept him awake at night and had stuck in my mind since I was about 10 years old. I still don’t know why he chose me. My brother serves in the military and, in my opinion, would have been the better choice. The only thing I can think of is that he knew I would see a deeper meaning to the story and perhaps get the opportunity to re-tell it, learn from it and teach others. I, like my granddad, see no glory in war. The press give us statistics which dehumanizes the efforts. We forget that on both sides people are involved. Lives are lost and families have to bury loved ones. My granddad didn’t see marching on the beach in Normandy or serving his country the way he did as anything to be proud of. He saw it as senseless. He saw people he knew being killed in a strange land for reasons he couldn’t understand. My granddad won several awards for his time that he served and never went to collect his medals. It wasn’t until after he died on a trip to the national archives building in Washington D.C. that we learned how many and what an effort he had put in. So thanks Andy for the opportunity to talk about my granddad. He passed away at the age of 80. He was about the nicest person you’d ever want to meet. He had a great sense of humour and the mouth of a sailor at times. If telling dirty jokes was an Olympic sport the USA would claim the gold. He had a generous and kind heart and would do anything he could to help his friends and family. I like to think that some of him has rubbed off on me. I have two stories of WW2. My granddad, my dads father, went into concentration camps Belsen and Auschwitz. He told me the story of when they went into the town and made the locals clear up the concentration camp; they claimed they knew nothing but he said you could smell this musky lingering smell. Like nothing he had smelt before. He said the horrors in Belsen was nothing like he had seen. He said for most his life he had difficulty sleeping having seen what he had seen in that camp. My Mums father, my other granddad, I have so much respect for on a personal level. It didn’t surprise me at all that he saved lives in Egypt when he lost friends in a horrific fire in Egypt. I think we was fighting the Italians; he said that Italians always walked in single file they would hear gunfire and surrender. He managed to get a very well paid job due to his heroics after Egypt. Granddad also served in Lebanon and Palestine. part of which became Israel. He always kept quiet about the war, he never really bragged or even really told stories, he only mentioned this one episode. After my granddad died in 2005 I found lots of letters and photos of his time in WW2. I suppose that’s why I had the respect I did for him because he never liked long speeches or taking credit for anything. I guess I’d say he was humble. My grandad and Uncle Fred were in Tunisia during World War II, grandad in the tanks using a flamethrower. Uncle Fred wrote a book about his experience in Qued Zarga, Tunisia, one story was- Midday our company received orders to go forward at 17.00hrs. Vickers machine guns gave us cross fire cover over our heads as we descended the hill. Company officer captain Morgan, took the lead and I was following him down the hill, the rest of the company following in single file. Approaching the valley between the hills an enemy machine gun opened up, we fell flat to the ground, while our platoon mortar man returned 2in mortar shells. Captain Morgan stood upright and fired several shots with a rifle, receiving a hail of machine gun fire through the stomach, he fell like a log quite close to me. He said,”tell the corporal to get the men out of here. “(One of the stretcher bearers told me later that captain Morgan died the following day. ) The shouting of the words ‘stretcher bearers’ could always be heard everywhere whenever in action. Also my uncle Willie was on the HMS Southampton when it was torpedoed and sunk and survived. I only got to see my grandad a couple of times a year due to him living in Scotland and money being tight. On one trip when I was thirteen years old I was fortunate enough to have him all to myself one afternoon. 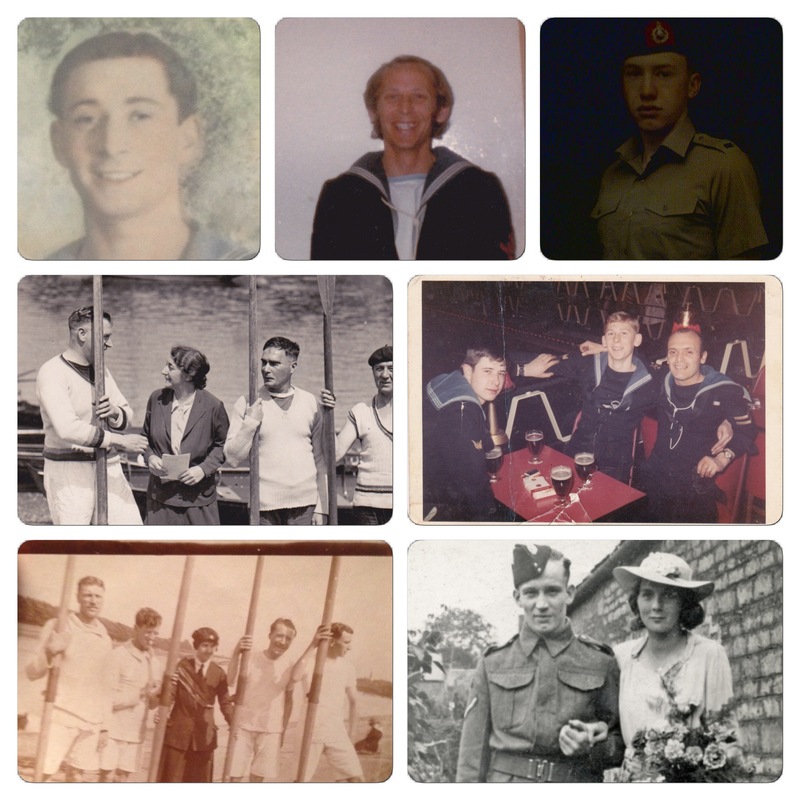 I never know how we got onto the subject of the Second World War, my grandad had served in the navy and as far as I’m aware had never talked about it before to anyone and I don’t think he ever did again apart from a few funny little tales that usually involved him getting into mischief. However I have always shown an interest in the First and Second World War so maybe that’s how. Anyway I think I was trying to impress him with my knowledge of dates, facts and figures as most kids do when he quietly rose from his chair and went upstairs, when he returned a few moments later. Nearly fifty years after the end of the war he sat me down and showed me a photo, it was a black and white photo of the group of men he had trained with. He then proceeded to name each person by there first name and surname and then inform me of what ship they went down with and when. If I remember rightly there was twenty men in that photo, there may have been a couple more but one thing I do remember, there was only my grandad and one other that had survived. That afternoon my grandad taught me so much and some of the things he taught me I didn’t realise until years later but I like to think he knew what he was doing. 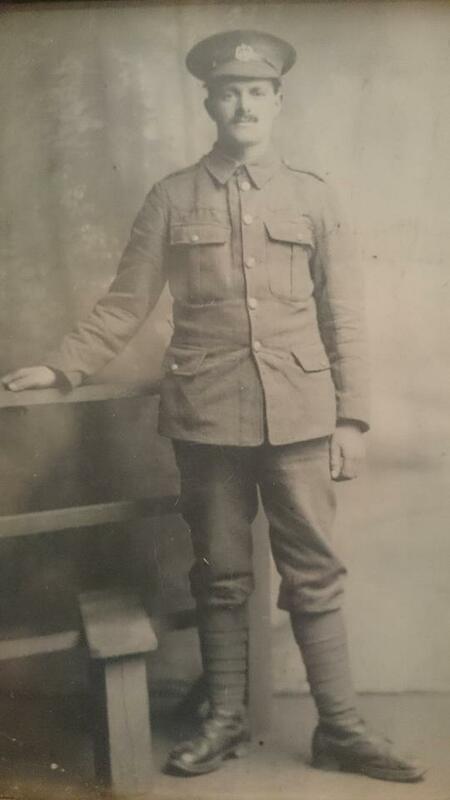 My great grandfather William J Merchant, during World War one he fought in Northern France, he came home injured and my grandmother was conceived, unfortunately after he returned to France he was killed in action in the battle for Albert, which is where his grave is. Sadly he never met his daughter. He was a volunteer soldier with the Essex Rifles regiment. Second is my father, served in the navy as a communication officer during the Cold War. He joined at 14 when a navy boat docked and asked the local boys who wanted to join the navy, my dad raised his hand and was told to pack a bag, go tell your parents and get on board. Third is a 16 year old me during my basic training in the Royal Marines. 2 left hand pictures are my great grandfather Joseph Gimber. He served in World War 1. He was injured during duty taking a grenade to the face permanently blinding him. He still served by doing communications and I still have his Braille typewriter. He was a keen rower, even when blind. He’s the one on the far left, all the males on my mothers side are over 6″2′. Top photo on the right is my father when he was based on Singapore, he lived there for 5 years of his service, he’s with two of his bunk mates. He can’t remember their names. Finally is my grandfather who served in world war 2. This was his wedding photo from August 1941. Top is my great grandfathers “dead mans penny”.These were issued to the next of kin after the Great War. These were made of bronze and known as the “Dead Man’s Penny” because of the similarity in appearance to the penny coin. 1,355,000 plaques were issued, which used a total of 450 tonnes of bronze. To the left are about 40 letters sent during the Great War and some after, some of the letters still have visible postage dates. Even though my great grandfather was blind, he still got mail which was read to him. Second picture is a machine gun bullet, now filled with concrete and was my grandfathers (wedding photo) door stop. This is a similar bullet to what would have been used against the allies during the d-day landings. I used a playstation controller as scale. 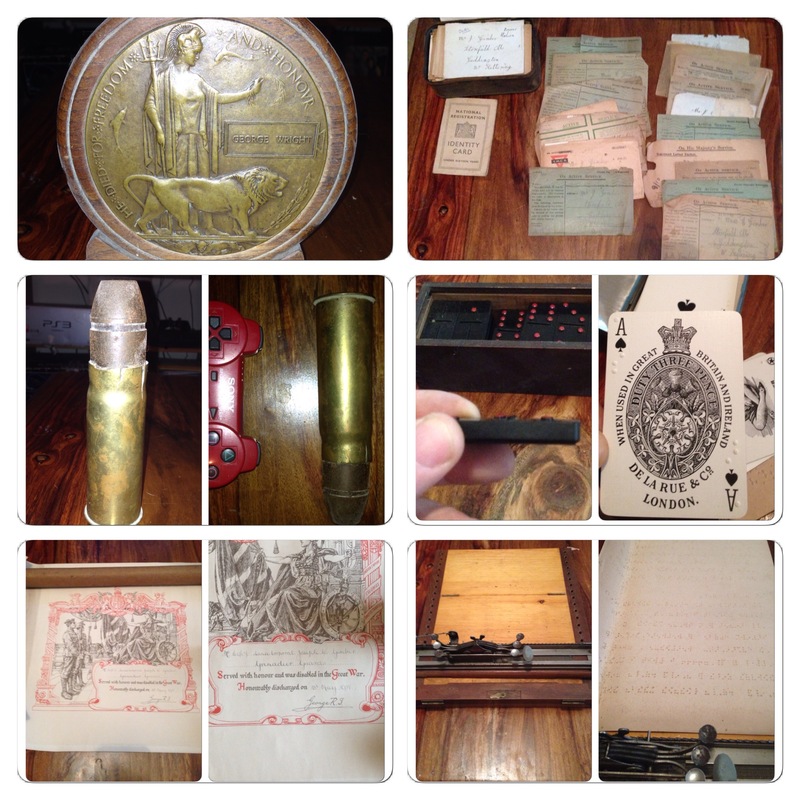 To the right are my blind great grandfathers dominos (which were raised) and Braille playing cards. Unsure when he revived them though. Final row is firstly my blind great grandfathers discharge papers which them were scrolls and shows he was discharged in 1918. Final picture is his Braille type writer with several documents which are in Braille, he later taught people to read Braille.